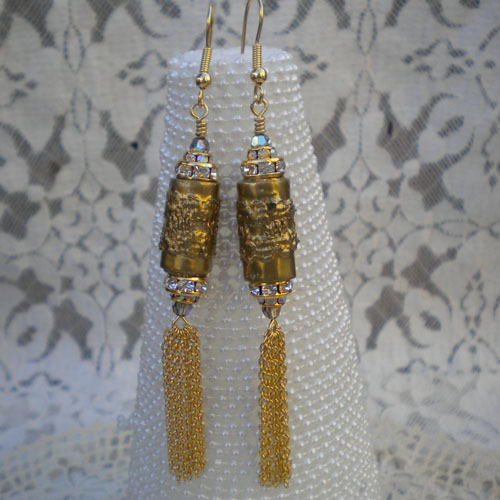 Home » Paper Bead Creations » Midas Touch Paper Bead Earrings Giveaway! 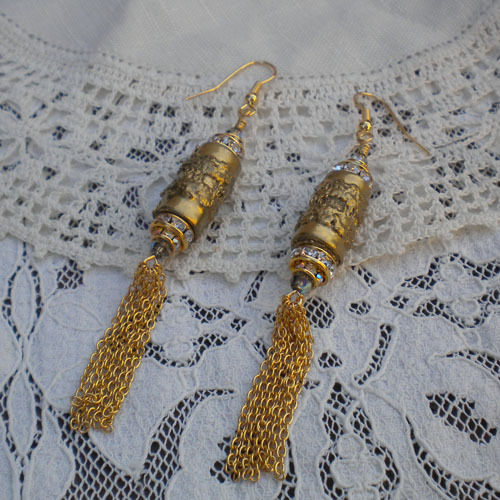 Midas Touch Paper Bead Earrings Giveaway! Christmas is finally over and now looking forward to New Year. If you’re like me, I will just wear the same old black dress and accessorize! I have something for you I think is New Year’s Eve party worthy. It is very, very inexpensive but can be customized to match your outfit. I was playing with paper beads (as usual), and came up with something that has texture and can be custom made to your liking. I am giving away this pair of earrings, all you have to do is write me a comment on how you think I made the paper bead that’s the main component to this earring. Since I am only picking one, I will give instructions on how to make them on my next post. Fair enough? 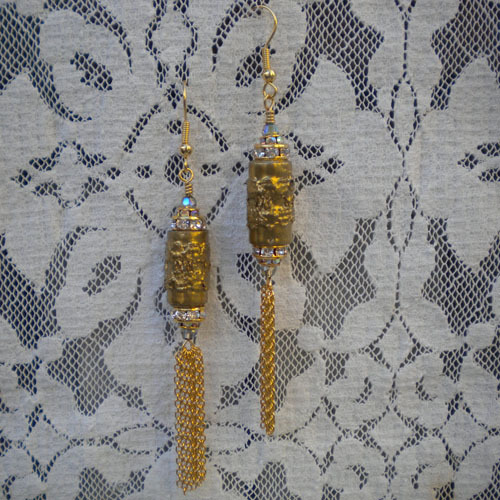 Okay, here’s images of what I call my New Year’s Eve Party Earrings. I can tell you this, I used the metal paper bead roller, to come up with the tube shape paper bead. In my next post would be a how to in silver this time. Good luck and thanks for stopping by. Don’t forget, just a short comment on how you think I made the paper bead tube. Good news is I would even ship international. Wow! I have no clue how you made those beads, but I’m really interested in learning how you make them! 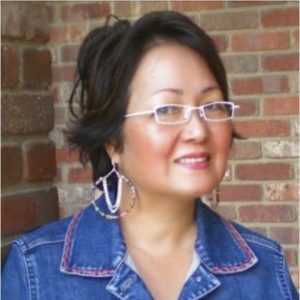 Glad I found your site!! I honestly have no idea how you made these but will be doing some google searches in just a few minutes. 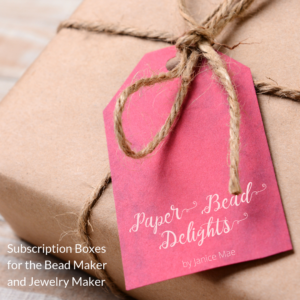 Making beads of out recycled paper into jewelry is a very neat idea. I am guessing that you rolled embossed designed paper over the clear tube…. Lovely pics! Lovely earrings! I’m guessing you used a clear ink pad to stamp an image on gold paper and then embossed the design using clear embossing powder and a heat tool. Last step would be to roll the paper using the bead roller tool.